Jinjako Arrived at the Training grounds. He was ready to get this over with. This training is going to be a tough one. First off Jinjako wasn't very fond of the person he was training and he Really wanted to be part of the fight. All the more reason to get this done quickly. Jinjako waited for the boy to arrive. "You know I don't like you right?" Out came Rensaku, reluctant to work with someone like him, one who lacked a mind to think with. Sweeping his hand he was able to carve out a line between the two, then he took two steps away from the line. "you can teach me from that side of the line, cross it and I'll leave, then you'll have to answer to the commander yourself." He then folds his arms,'your move' thoughts whispered in his head, he knew his stubbornness would make training him near impossible but it was worth getting on his nerves, hopefully the old man would blow a fuss, then he wouldn't be a problem. "Very well, But Im going to warn you, I do not need to cross the line to train you." As soon as he said that, his Spiritual pressure rose. Water began to sirls around him. Then about a 100ft circle of water surrounded them, and rose to form a dome. Then he rose his hand and a lightning bolt struck the water. Electrifying it. Then he spoke again. "No that that is settled, no one is leaving. I am under orders to train you until you get your bankai. And to not stop until you do. That is what I will do. Now prepare yourself." "Good, and for the future, make sure you keep you stay at least 25 yards away from me." 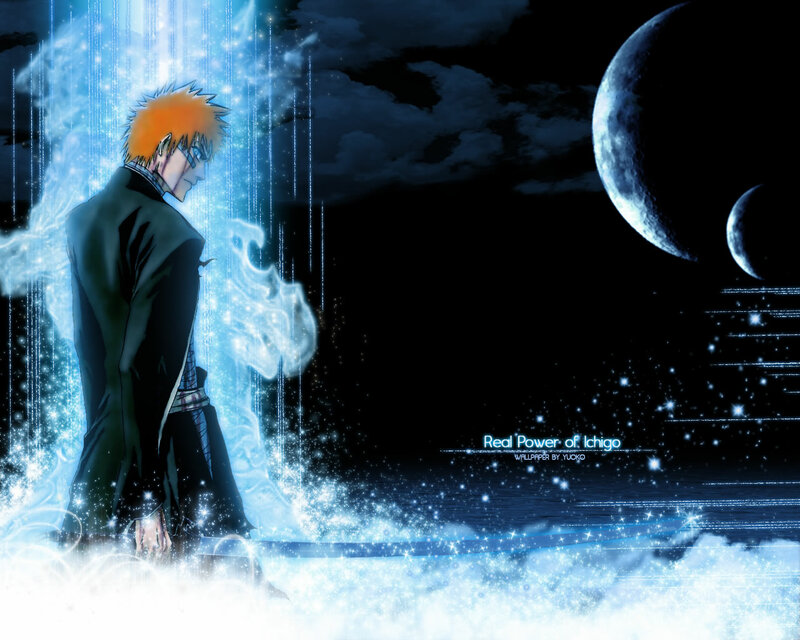 He would never forget the first time meeting him, the memory of a typical Shinigami would be what remembered. "You really think this is going to stop me from leaving? It's just water, plus I wouldn't feel anything you threw at me." Referencing his stamina and shikai ability which would make him technically immortal, nothing could hurt him so a beating would be a waist of time, not only that but he may be able to get through the dome. "Dont get cocky boy.... My age and power surpass yours. So if you think you can escape, be my guest, its your body you will be destroying." Jinjako released his shikai "Rain, And Strike the skies! Inabikari Tansan kemono!" This was going to prove fun. But he wouldnt kill the boy, just toy with him a bit before getting too serious. Jinjako the shunpoed to the top of the dome of electrified water. Then from his armored hand he dropped a rock, then struck it in the Direction of Rensaku. A bolt of lightning Raced toward him. This was his move, nothing fancy, nothing special right now. Ren chuckled at the old man who confirmed that he was just an old fart, he'd have to hurry and end the get through the training before he fell asleep on him. Whatever it was he hit at him was completely masked by the lightning blot that was headed toward him, being the cocky guy that he was he held his finger toward it. BOOOM the bold exploded, sending him tumbling across the ground till he came to a stop. Lying on his back he acknowledged the power that he had. "Not bad for old geezer but, He stood rose up from the ground unharmed by the attack, as a sign of arrogance he dusted himself off, though the smoke continued to rise from his body. "It's going to take something massive to hurt me. Ren folded his arms, waiting on his move again, he wasn't even going to bother show off his skills. Jinjako watched as the boy decided to take the bolt head on. Foolish, tho it wasnt at full power. "Geezer? Learn your Place Boy. I am Head of the Hiroji Noble order! Sister to the Kuchiki Clan! How dare you." The small orb raced toward the front of Rensakus body, then he shunpoed again behind his and shot another at his back. Then jumped into the air and shot another down from above. "head of what? Sister, I thought you were a guy.. Yup, that's old age for you, you can't even remember your own age. he laughed, then he was hit in the front with a small orb, followed by another that hit him in the back with kept him from going in any direction. Again, you'll need something massive if you want to hurt me. Not only that but you're so old you forgot to stay on your side of the line... Some wise fart you turned out to be." he started toward the edge of the dome, pulled out his sword and proceeded to stab through it, unfortunately he wasn't strong enough to pierce the dome. 'That's pretty strong to say it's just water' he thought to himself, he stepped back from the edge, sheathing his sword again. "Now that I'm thinking about it, how do you even remember your release, I'm surprised that's not a challenge all to it's self not to mention all five abilities for both your shikai and bankai, really, I applaud you. He said, clapping his hands. Jinjako laughed on the inside, this boy was cocky. A bit too much for his own good. Well it had to be done, and the only thing really to do is to bring it out. Its power pulsed, "Weither you like it or not, Im going to attack you..." Jinjakos speed was incredible, he charged for Rensaku. Slashing at him. He Shunpoed behind him, Slashed again. Then Shunpoed right above him, "Hado #63. Raikōhō!" And when he thought it couldn't get any better he actually heard it, his bankai was being revealed right before him. He laughed at him, even smirked alittle,"It's a shame that you would allow a boy to stir you up enough to make you go against your word, you even called out your bankai. He shakes his head, pitying the guy, that's when his blade struck twice, even hit across his head with what felt like kido. Ren is seen face first on the ground, the attacks didn't hurt and couldn't stop him, he knew this wasn't big enough, he stood from the ground, then looked in the direction of the man. "I swear man it's like you're not even here." He said, not acknowledging the cuts and burns on him, he wasn't in any danger, yawning he puts his hand on the hilt,"No ash, no blood, no bones." His body was covered in flames, healing him instantly, removing the cuts and burns from his body. Fire bath: Covers Ren in fire, heals wounds, recovers lost stamina and allows him reattach lost limbs. Clever boy... Its about time he released his shikai. Now jinjako can get some what serious. "Lets see how you fare now that you have released your sword." Jinjako calmly said "Burto" Bolts of lightning crashed around his sword. He them directed them, full force at Rensaku. These bolts had some strength behind them, nothing to laugh at. Jinajko them Shunpoed and Punched at Rensakus back, then Shunpoed in front of him and Kicked hard at him. And then shunpoed a bit away. Jinajko continued to raise his spiritual pressure, anyone within 200 metters opf the dome where on the ground unable to move. "Honestly, this is the scenario, it's not about if I can beat you, it's about how long it will take before your old bones give way and you become tired... So the question is, how long can you last? he asked, a great deal of spiritual energy gathered in the form of electricity which he sent in his direction. The hit throws him into the dome which electrifies and blows him forward only to be kicked and punched. Again, he lays on the ground, he could feel himself giving way to his boredom, he almost felt like taking a nap. "Really, this is what you call big? I'm serious, it's like you threw a pillow followed by two baby hits. As he rose once again the air around him began to thicken, he was then pressed down to one knee by a mysterious force. "Ah, your nee plan is is to hold me in one spot now. Well I for one won't take this sitting down. He slowly fought to stand up right,"So I'm going to stand." he said, with his usual defiant, arrogant smile. He then placed both hands behind his head, the gesture show cockiness in it's finest, it was basically allowing him to strike him in the chest. The boy wasnt goign to give up his cocky attitude, Jinjako Laid on even more spiritual Pressure. Then he went to slash again, sending more and more bolts of lightning. He decided to use both swords of his now, slashing and slashing, he then raised his blue sword in the air and sent a blazing hot and super fast spinning ridge of water straight toward him. Then he jumped righ5t in behind the wave with his yellow sword going in for a small cut on the mans face. "Time to get Serious boy...."
As much as the man attacked he was ignoring them, the body shots, the lightning, even the cuts to his face, none of that mattered because this is what he was trained for as a child. That's why no matter how many times he tried, no matter how many times he took a hit, none of it hurts because he was forcefully trains for it. "I can get serious, if I play your game I would still win but I would have to do work. Do you really want to know my plan? His pretend cocky face went away, the darkness within him reappeared on the surface, the inner wolf had come out again. He attempts to places his hand the man's shoulder before making eye contact. "Actually I discreetly mentioned it earlier, I was going to keep provoking you, you would then keep attacking until you tired out, that's what you do when someone's stronger than you, His eyes glowed with flames that began to envelope his body, assuming his hands were on the mans shoulder the fire would attempt to burn his arm enough to leave a hand scar. "so tell me, do you really think you can beat me, especially since I've already been through this?" he said as the flames circled around him, setting the ground on fire which was going to leave a permanent mark on where he was. His berserk side began to take control of him, knowing that Hiru was trusting him not to loose it while he was gone he took the time to back off and recollect himself, which didn't work."Aaaaaah! he let out a loud battle cry filled with blood and rage, even regret, the fire around him infinitely expanded to fill the dome, he even transformed into a wolf of fire. There was no escape, fire would continue to burn, the dome began to look more llke hell. Jinjako was waiting on this. A time where he diodnt have to hold back. The boys hand tried to touch him. But jinjako was to fast. He shunpoed out of the way. Then he mentioned somethign to the boy. "Do you feel it yet? Your vision blurring, surroundings getting more and more confusing? That small cut I made, even if you heal it, its effects are still in play." Jinjako waitined, now he didnt have to hold back. but he was saving this until now. The man spoke but Ren couldn't understand his tounge when he was ion this form, suddenly his field of view was gradually lessening by the second. He knew it wouldn't matter if he could see or not, he didn't need to see, his ability to sense spirit power was good enough for them. He let out a howl, one similar to a hollow before reverting back to his normal, humanoid self. He then crossed his arms, looked in the general direction of the spirit energy then laughed, amused at the attempt to blind him. "Though you may be slowly taking away my sight that still doesn't matter, you're not going to win simply because I can't beat myself. the fires that filled the dome subsided, he couldn't believe he let himself end up like that because of him. "So tell me, where exactly are you going with this? he asked, drawing his sword, though it would pointless to use it he figured it'd still serve to show he wasn't joking. The sword gathered fire, he stuck the ground. Fire in the form of a sphere shot out in his second attempt to hit him. O.O.C: Forgot to mention my abilities from the last post. Fire Domain: Ren covers an infinite are in flames, if an enemy steps in to it the fire will burn them. Flame Wolf: His flames cover his body in the form of a wolf. Will negate one attack or cut the damage in half if the attack is stronger than his stamina. Eternal Flames (Passive): He will be able to use his flames outside of his shikai. "Who said anything about winning?" Jinjako, to prove he wasnt going to be backing down watched as the fireball came near him. A water shield formed in front of him, taking the damage from the fire ball. As he did this, he shunpoed behind the boy. "Boruto" The bolts went flying. "We will bring your bankai out boy." Jinjako then shunpoed in front of the boy. He put the power of his lightning behind this kick, and he kicked hard. "Ummm, I did." he responded as if the answer was right there. "But that doesn't matter anyway, we're not here to fight, we're here for me to learn a bankai... A lightning kick sends him flying off beyond the line that he set earlier, this time he was able to recover mid way in the air, setting himself up right only fall over due to his poor vision. Rising from the ground once again he plants his hand on the ground, a fire tornado surrounds him, burning any physical attack that came his way. Jinjakio watched the tornado of fire. Funny, Protection? Jinjako waited for the next move. He stabbed his swords into the ground, as soon as he did that,a barrage off lighting bolts and a wave of water appeared around the swords, in a rage they swirled. As the fire grew the spiritual pressure became tense where jin was, suddenly he was hit once again, luckily for him it only the upper, right and left portion of his chest, flattening him under it's power. "Ok, now we're going somewhere, what else do you have?" he hand-sprung to his feet, he felt it coming, the old man wasn't holding back anymore. Jinjako kept his swords in the ground. He was focused on training, serious training. His intent to kill grew. The only way to train properly is to get way to serious. Lightning crashed around him. Jinjako shunpoed behind Rensaku and kicked upwards. The above and kicked down. Then released a barrage of lightning bolts and water spears. Covered in kido that then turned into ice he stares into an empty space. 'Alright Ren, think carefully.' He said, he tried to use his fire to melt the ice but the kido itself was just too strong for him, he was just going to have to wait until the ice went away on it's own. He couldn't see anything but he felt ice breaking from an outside force, an unknown kido, electric base but it could easily be apart of his bankai. Without warning an attack sent him into the air only for him to sent back toward the ground with lightning. He returned to his feet again. "The Effects of the Vision Blurring should be in full effect now... This is to break you down, to use your other instincts. Is this serious enough for you boy?" Jinjako landed in front of Rensaku and kicked him into the wall of the dome. He then held out his hand, his Blue sword erupted from the ground and raced to his hand. He raised it and struck down at the boy. If the boy didnt stop this with his sword, Jinajko would stop it before it killed the boy. "Serious, more like typical training for an onimitsukido graduate..." He just couldn't get the man to understand that he's been through training on this level and worst in the past, which is why he kept constantly asking for something enormous. "You'll understand when you get older." Ren said as if he was older than the old man, like he had more experience than him. "So I ask you. he said as he shunpos from the wall of the dome as close to center as he could, unknowingly he dodged the sword attack that would mostlikely left a huge scar. "Do you have anything bigger than this?" he folded his arms as if the man owed him. Bigger? Jinjako knew the boy was tough, he had heard a little on his past. But the boy wanted more. Jinjako rarely used this because his inner power always took control and made it stronger than normal, but he had it under control for the most part. He then gestured toward his Other sword. It came flying into his hand. He awaited to see how the boy would handle this one.